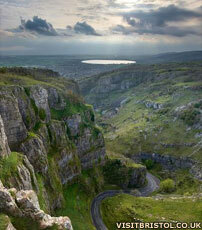 Gough's Cave in Cheddar Gorge, Somerset, contains a site that shows us our cave-dwelling prehistoric ancestors. Around 12,000 years ago humans lived in this area, and some of their bones have survived. But these bones seem to tell a rather gristly story of death, dismemberment, and even cannibalism. The bones have been found in pockets along the cave walls. This would have been a good place to live because the inhabitants would have had a fairly dry place that would make a good camp, and where they would have a good food supply from the land immediately outside. The gorge would have channelled animals such as horse and red deer quite close to the caves, and this would have been a good position from which to set up ambushes to trap the game as it went past. Looking at the stone tools and the working of the bone and ivory, it can be understood that these people were very sophisticated hunter-gatherers. They would have used the caves on a long term basis rather than just as a temporary stopover. It also had some possible greater significance. Some of the objects found there are very unusual ones. These include a piece of rib that had been cut and shaped with a series of notches along the edge of the bone that makes it seem to be some kind of counting device, or even a basic calendar, which suggests that the cave site was important to the people there. This leads to the conclusion that there could have been some kind of ritual activity taking place. Human bones have been found, and these were in a strange condition. Many of them had marks on them which were made by stone tools, found to occur on the edge of the chin, on the side of the head at the jaw, and on the back of the neck, along the vertebrae. The marks are just the same as marks found on animal bones. These people would have systematically butchered the animals that they captured, and would have done a clean job with their flint tools, taking the bones apart and then smashing the longer ones to remove marrow. The markings and the breakages on the animal and human bones are exactly the same. The conclusion is that they were probably eating the human bones as well, as the method of disposal shows that all the discards were put in the same place, mixed uncaringly. This doesn't necessarily have to be true. It may have been a ritual burial which did not include cannibalism, or they may have practiced a type of ritual sacrifice. It may even be the case that there was a severe shortage of food for a time. However, the case for cannibalism has become a widely-accepted one amongst scientists since the first discovery. Any uncertainty has largely revolved around whether the practice of eating other people had any symbolic significance. In 2011, Silvia Bello from London's Natural History Museum and her colleagues presented three skull cases which they said could have been used as drinking vessels. The braincases had been fashioned in such a meticulous way that their use as bowls to hold liquid seemed the only reasonable explanation. That interpretation looked even more likely given later research. A fresh report in 2017 announced that the cuts on human bones were deliberate. They were not simply butchery marks, and neither were they teeth marks. What is more, the zig-zags appeared to match designs used on other engraved objects from the same time period. 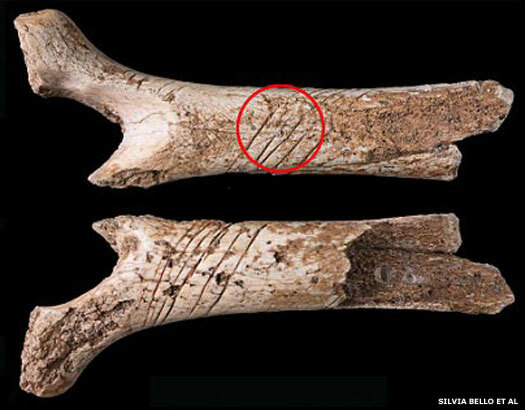 Silvia Bello was again behind the research, stating that the engraved motif on the Gough's Cave bone was similar to engravings observed in other Magdalenian European sites. What was exceptional in this case was the choice of raw material (human bone) and the cannibalistic context in which it was produced. The sequence of modifications that had been carried out on this bone suggested that the engraving was a purposeful component of the cannibalistic practice, rich in symbolic connotations. In previous analyses they had been able to suggest that cannibalism at Gough's Cave was practiced as a symbolic ritual, but this study provided the strongest evidence for this yet. Text copyright © P L Kessler. An original feature for the History Files, based initially on notes from Channel 4's Down To Earth series by Doctor Catherine Hills, 1990.